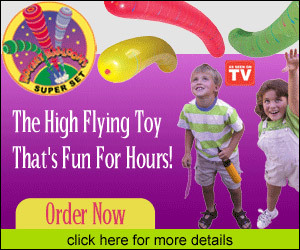 As Seen On TV – What makes Rocket Balloons such a great toy is its simplicity. Rocket Balloons come in vibrant shades of pink, yellow, green, orange, red and blue. When charged with the Two-Way Action Pump they will grow up to 36 inches in length. Every Rocket Balloons has a specially designed neck that funnels the escaping air into a thrust producing a plume of air that launches them high into the sky. Watch them soar above houses and trees as they whine and buzz while filling the sky with color. Hear the rocket shriek and see it jump as the pneumatic thruster gives out its final push before the Rocket Balloon floats back to earth ready to be recharged for the next flight. Rocket Balloons can be used in-doors and out. Their soft rubber tips mean no marks or chips on walls and no broken windows.